With Bing's first live CD "Live At Old Songs! ", people who have never seen him live got a taste of his extra-special performances. "Live At The Sarasota Folk Festival" is a 170-minute DVD featuring two sets by Bing as only he can let it rock. Laid-back and informal with the audience, this is the next best thing to being there. Watch a preview here on YouTube! Check out three pages from the book featuring a unique color-coded graph to identify elements of the chromatic fretboard. Listen to the lead tracks, follow along with the sheet music and then, once you've got the hang of it, play with the backing tracks! Book 5 in the "Mountain Dulcimer In The Band" series is now available and again, by popular request, it features 16 gospel songs! Once again, offering up arrangements on two discs to encourage and challenge the solo mountain dulcimer player, these tracks feature traditional tunes with a backing ensemble that features up-tempo pieces as well as mellow styles. 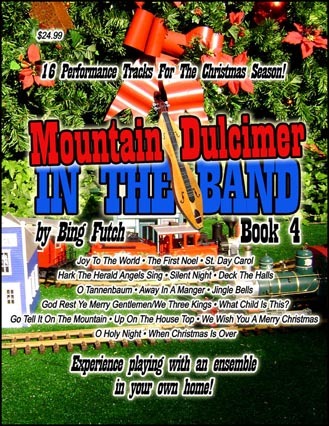 Book 6 in the "Mountain Dulcimer In The Band" series is now available! Once again, offering up arrangements on two discs to encourage and challenge the solo mountain dulcimer player, these tracks feature traditional Celtic songs with a backing ensemble that runs through ballads and airs as well as fiddle tunes. 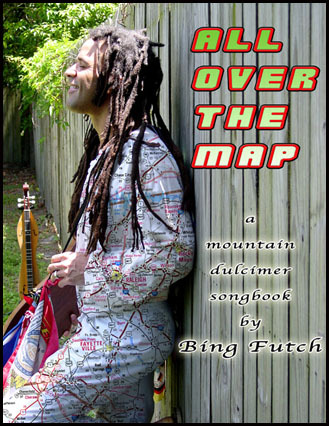 Bing's first mountain dulcimer book presents a collection of songs that cover a wide range of genres and styles. A sort of companion book to his first mountain dulcimer release "Dulcimerica: Volume 1", this collection of 20 tunes features many pieces that were featured on that album including"Swing Low Sweet Chariot/He's Got The Whole World In His Hand", "Please Bury Me By The River Shannon", "This Road This Moment", "Gold Trails Hotel", "From The Hills To The Sea", "'Tis Only Faire" and "Sunday Morning." Most of those tunes are original compositions and they are joined here by some of Bing's other works including "Summer At The Fair", "Seminole Solstice", "Amazing Grace (Miles To Go)", "I Cried For Days", "The Pirate O'Reilly", "Minutes From Manitou" and"Garden of the Gods."